Day of Install of 30' Monterrey. 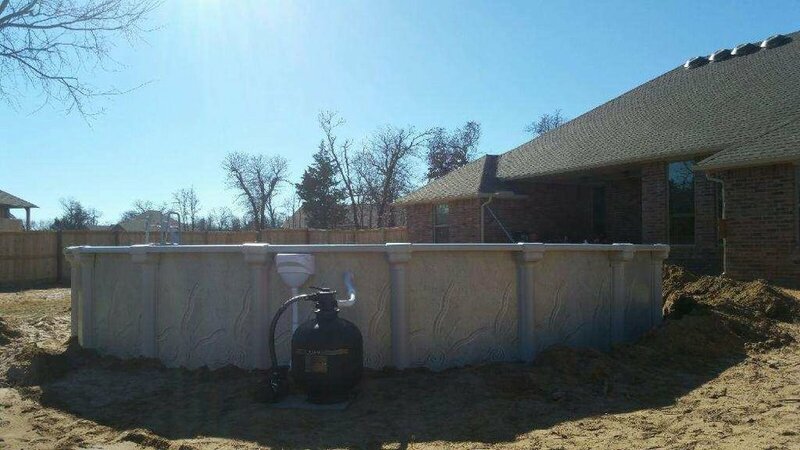 How long will it take to install my new above ground pool? Generally speaking, it will take approximately 3-5 hours to install and 18', 21', or 24' pool and approximately 5-7 hours to install a 30' or 33' pool. Is dirt work included with my above ground pool install? Six inches of dirt work is included-anything past the first six inches is $100/additional six inches. Will you haul off the excess dirt? We do not haul off the excess dirt. Most of the dirt will be used to secure the pool wall by constructing a berm around the pool once it is filled. Please refer to your Pool Owner manual for a discussion around building a berm around your new pool. When will the sand be delivered prior to our install? All of our sand deliveries are scheduled through separate companies that deliver sand in your respective area. They run on their own schedule, but we will call you to schedule and will be able to give you an approximate time frame for the delivery, or can request the company contact you when they are in route to your location. Where should I have them dump the sand? You want them to dump the sand as close to the pool placement area as possible, just not in the area itself. This is to minimize bobcat tracks in your yard, and the amount of time it takes to place the sand. If it is not possible to place the sand into the backyard, most customers place the sand in their driveway. How long will it take to fill my new above ground pool? Fill time will depend on your water pressure and how long you keep the water hose in your pool each day. The installers will have a small fill pool that will be filling with water while they install the pool. They will pump that water into your pool before they leave (this is generally 6 inches - 1 foot of water). This will give enough water to hold up the walls of the pool-it is the customer's responsibility to continue filling the pool. Can I call the fire department to fill my pool? You can see if your local fire department will provide the water but be wary of the water pressure coming from their hoses. Sometimes the pressure is too hard and will ruin the smooth sand bottom of your pool which will not be covered under warranty. Will the installers add chemicals to the pool? We will provide all the necessary start up chemicals for your pool, but we will not add the chemicals at time of install since the pool will not be full. If you bring a water sample to Country Leisure, we will be happy to test if for free and recommend any adjustments.